There are, and have been for some time, claims by UFO disclosure supporters that there is in existence a fleet or fleets of human spaceships charged with monitoring alien traffic throughout our solar system and even defending our solar system in the event of an extraterrestrial attack. If Solar Warden is indeed real, it would require advanced technology several generations ahead of what our military currently uses on the battlefield. Some speculate that backwards engineered alien technology is responsible for the rapid development of these types of systems. Astronaut Dr. Edgar Mitchell, the sixth man to walk on the moon, is probably one of the most high-profile persons to have come forward regarding the existence of alien beings visiting Earth. 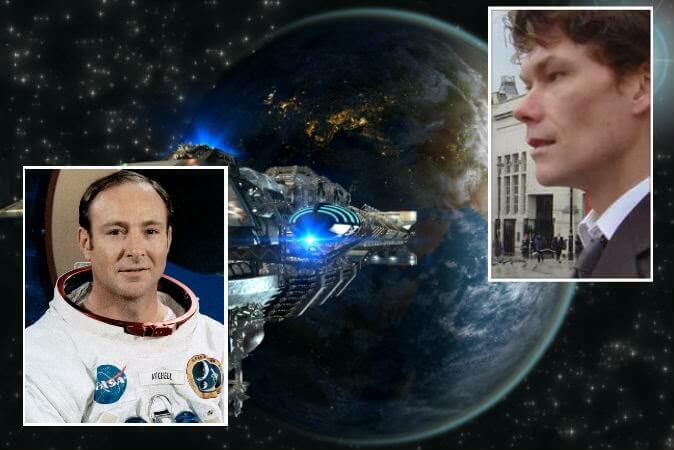 He has addressed the topic in several interviews, saying there are indeed extraterrestrial civilizations beyond our solar system, they have indeed visited Earth, and the United States government may have collected and backwards engineered alien technology. “I suspect that in the last 60 years or so, that there has been some back-engineering and the creation of this type of equipment, that is not nearly as sophisticated yet as what the apparent visitors have,” stated Dr. Mitchel during a Kerrang Radio interview on July 23, 2008. In 2001, a hacker named Gary McKinnon used a series of clever techniques to hack several government computers, including and probably not limited to NASA and U.S. Navy computers. His original purpose for hacking U.S. computers was to seek out hidden data regarding the existence of free energy, or “zero-point” devices, he told Wired in a 2006 interview. In his digital travels he allegedly uncovered an excel spreadsheet with a list of names and a heading of “non-terrestrial officers,” he told Wired. Another document was listed as “fleet-to-fleet” transfers, according to a 2006 Project Camelot interview. McKinnon was unable to cross reference the names with any U.S. Navy ships and believed these were off-world or “Space Marine,” type officers. McKinnon told Wired he was in the process of viewing a UFO image on a NASA computer in Building 8 of the Johnson Space Center remotely when he was discovered. Some months later (in March 2002), authorities showed up on his doorstep in the U.K. Severe hacking charges were brought against him and he was facing about 70 years in prison and $2 million in fines. But in the years following his discovery, the U.S. government extradition request stayed in limbo until it was eventually dropped. Project Camelot speculated that McKinnon was holding “ace-in-the-hole” information he gathered during his hacking journey that he may have held as leverage against his extradition. McKinnon wouldn’t comment on whether he had such information. The name “Solar Warden” is a term that generically refers to the ultra-secret space fleet. It’s presently unclear where exactly the name originated. If the program does exist, it would require a tremendous amount of capital to construct its fleets. Last year, the United States’ black budget for secret programs spanning dozens of agencies was $52.6 billion, according to the Washington Post. In 2011, the U.S. government spent approximately $718 billion more on national defense and international security. Of course, much of that went to fighting the war against terrorism. However, if the government did decide to build a space fleet of exotic technology and design, the money could be utilized, especially if more than one nation is involved and funneling money into this program as postulated by some disclosure advocates. Currently, the U.S. government’s various military branches all have their own space commands, such as the Air Force Space Command and the Navy’s Space and Naval Warfare System’s Command (SPAWAR). These departments have public websites and they help coordinate the military forces on the ground, in the air, and at sea. It is unclear if these departments may be linked with the so-called Solar Warden project, or if this alleged project would be separated into its own covert and isolated department.